A new poll suggests the majority of Toronto residents are “strongly opposed” to Premier Doug Ford’s use of the notwithstanding clause to carry out his plan to slash the size of city council. The poll, which was conducted by Mainstreet Research, randomly sampled 802 Torontonians over the age of 18 and found that 65 per cent said they oppose Ford’s use of the clause. Notably, approximately 56 per cent said they “strongly oppose” the move. His government is also seeking a stay of the court’s decision, which is being heard by three judges at the Ontario Court of Appeal today. Ford claims he has a mandate from the people of Toronto to reduce the size of city council, which he describes as “dysfunctional.” He contends that the move will make city council more efficient and will save taxpayers money. In his ruling released last week, Superior Court Justice Edward Belobaba wrote that there was no evidence that any public consultation ever took place on the subject and added that there was no proof that suggests a 47-seat council is in fact dysfunctional. He added that there was no evidence to show that changing the makeup of city council was an urgent enough issue that it should be done in the middle of an election. Ford’s use of the clause has been widely criticized by members of the opposition and Ontario NDP Leader Andrea Horwath has accused Ford of trampling on people’s rights to settle a political score with his former council colleagues. Prime Minister Justin Trudeau and former prime minister Brian Mulroney have also spoken out against the use of the clause. Mayor John Tory previously called it a “gross overreach” of the province’s powers. “Make no mistake about it: Doug Ford is on the wrong side of public opinion when it comes to his use of the notwithstanding clause”, Quito Maggi, president and CEO of Mainstreet Research, wrote in his analysis accompanying the poll. Speaking to CP24 on Tuesday afternoon, Joseph Angolano, the vice-president of Mainstreet, said most respondents very clearly believe in the Canadian constitution. “They believe in the fact that this is not a good use of a clause that is meant to sort out differences in legislation when one right trumps another. Using it to fast-track legislation and shrink council size is not something Torontonians agree with,” he said. 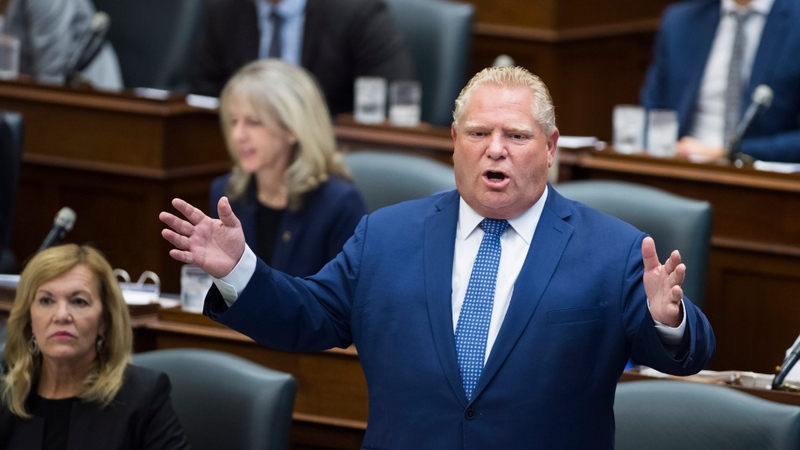 He added that even 60 per cent of the respondents from Etobicoke, the home of Ford Nation, did not agree with the use of the clause. It appears many Torontonians also do not support Ford’s decision to reduce the size of council, according to the poll. A little more than 55 per cent of respondents said that they are not in favour of reducing the number of councillors from 47 to 25 and 46 per cent said that they “strongly disagree” with slashing the size of council. The poll, which was conducted on Sept. 15 and Sept. 16, has a margin of error of plus or minus 3.46 per cent, 19 times out of 20.